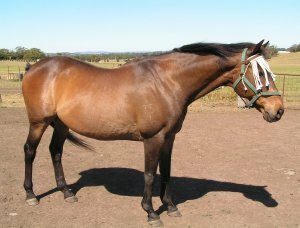 Whisky was born at Waldarrah in 2009. He is a section C Cob gelding, by FDL Jack Daniel out of a Section C mare Willers Park Ariel. Whisky was the first Fluer de Lys Jack Daniel foal i bred. He should mature 13-13.2hh. Whisky is super quiet and loves attention. Otis is a 5yo chestnut welsh A owned by Jodie Young and is here for my 6yo daughter to ride. Otis is doing extremely well. 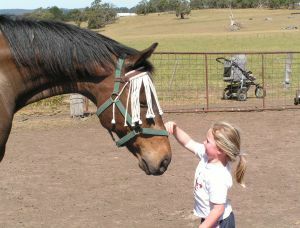 Maddy and Otis atttended there first show under sadddle together at the local Beveridge Gymkhana in Febuary 2010. Otis has now gone back to Jodie for her young daughter, Sarah to ride. We wish Karen all the very best with Wally. He couldnt have gone to a better home.Wally has now been sent off to the breakers, so it wont be long before we see him out and about. I am very excited to announce the newest edition to Waldarrah. 'Ari' is a rising 4yo gelding by FDL Jack Daniel out of Pennant Saphire. (He is FULL brother to FDL Tequila). Ari is starting his education now. Thanks must go to Ace and Sue Coughlan of Burrowa Welsh Cobs for allowing me to purchase Ari. 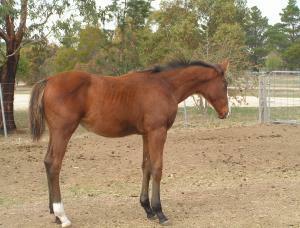 Galliano was born at Waldarrah in 2009 also. He is a Section C cob also by FDL Jack Daniel , out of a stunning Section C roan mare Ablue Moonflower. He should mature up to 13hh. He has amazing uphill movement with a super temperament.